Almost a decade ago, when Elvin Estela and Christopher Gunst were in college and DJing at Loyola Marymount's KXLU-FM (88.9), it would have been hard to imagine the pair carpooling, let alone collaborating. Estela, under the name Nobody, went on to produce three albums of trippy, sample-heavy hip-hop that gained him cred in the L.A. underground. Gunst matriculated to the psychedelic jangle of California folk rock as guitarist in Beachwood Sparks and later, with partner Jen Cohen, to Mystic Chords of Memory. With "Tree Colored See," released in April on local indie Mush Records, Nobody and Mystic Chords of Memory found common ground. As Gunst says, "As we got older, our tastes grew to include each other's music." The album sounds as sylvan as where it was written  a house Gunst and Cohen were renting on a 24-acre ranch in Santa Cruz County. Acoustic guitar, electronic beats and gentle melody are married in Byrdsian harmony. 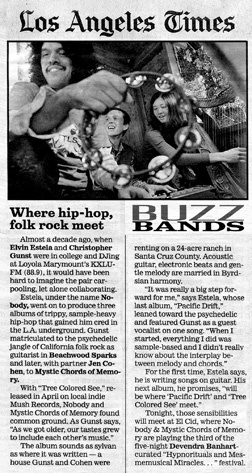 "It was really a big step forward for me," says Estela, whose last album, "Pacific Drift," leaned toward the psychedelic and featured Gunst as a guest vocalist on one song. "When I started, everything I did was sample-based and I didn't really know about the interplay between melody and chords." For the first time, Estela says, he is writing songs on guitar. His next album, he promises, "will be where 'Pacific Drift' and 'Tree Colored See' meet." Tonight, those sensibilities will meet at El Cid, where Nobody & Mystic Chords of Memory are playing the third of the five-night Devendra Banhart-curated "Hypnorituals and Mesmemusical Miracles… " festival.